he night before cooking, rinse quinoa thoroughly and drain. Combine oats and quinoa in a medium saucepan and cover with 1 cup boiling water. In the morning, bring oats and quinoa to a boil. Stir in almond milk, salt, and cinnamon and reduce heat to low. Cook, stirring occasionally, until quinoa grains are tender, 8–10 minutes. Meanwhile, preheat oven to 350°. Toast walnuts on a small rimmed baking sheet, stirring occasionally, until fragrant and slightly darkened in color, about 4 minutes. Let cool slightly. 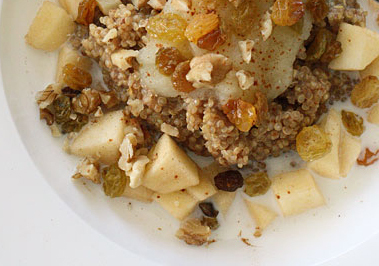 Top quinoatmeal with apple, walnuts, and more cinnamon, if desired. Drizzle with almond milk.